When college football attendance started to slip, schools didn’t turn to renovating their stadiums, giving out T-shirts, or even adding in free Wi-Fi to draw larger crowds: A few turned to offering alcohol at their concession stands – and so far, it’s worked. Alcohol and sporting events have a long history together, and it’s often tied to revenue for many of the stadiums, leagues, and networks that broadcast their games. In 2017, the NFL lifted its ban on hard liquor advertising, allowing for distilled spirits to occupy no more than four 30-second ad spots per game. Still, research in some countries has linked alcohol-based sports advertising to underage drinking, calling for an outright ban of alcohol from sporting events completely. 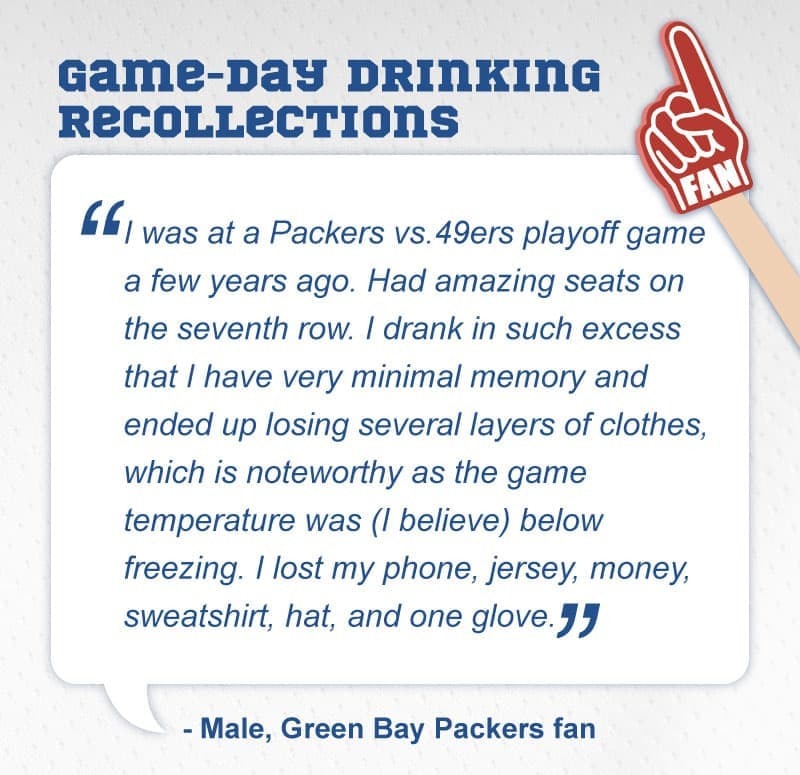 To understand the role alcohol plays in the American drinking culture, we surveyed over 1,000 people about how they chose to drink when witnessing their favorite sports events. Continue reading to see what we discovered. 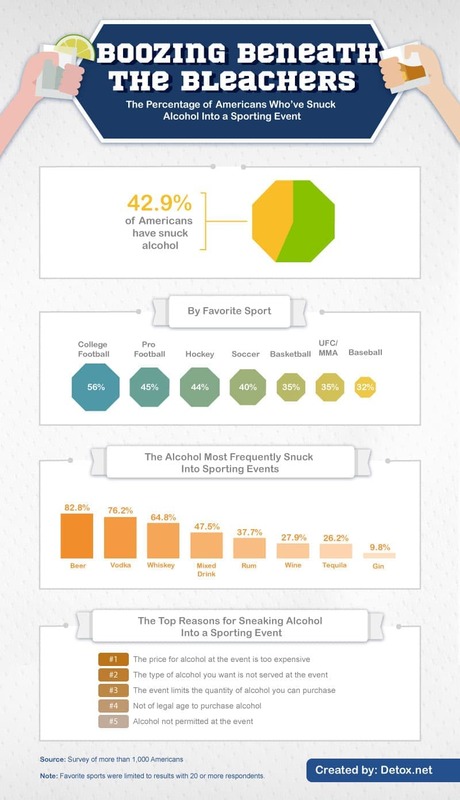 So which sporting events are the most synonymous with drinking, according to Americans polled? It appears professional football and hockey might just go hand in hand with alcohol consumption. Men and women indicated they drank just over three alcoholic beverages, on average, when watching an NFL or NHL game and were more likely to binge drink during football and hockey than any other sport. According to the National Institute on Alcohol Abuse and Alcoholism (NIAAA), low-risk drinking limits for adults are defined as no more than three drinks a day for women and no more than four daily for men – and even that depends on what you’re drinking in the first place. Binge drinking, which typically occurs after consuming four to five drinks in just a two-hour span, is one of the most common patterns of alcohol misuse in the U.S. As with excessive consumption of any kind, binge drinking can lead to unintentional physical injury (like car accidents), violence, and alcohol dependency. 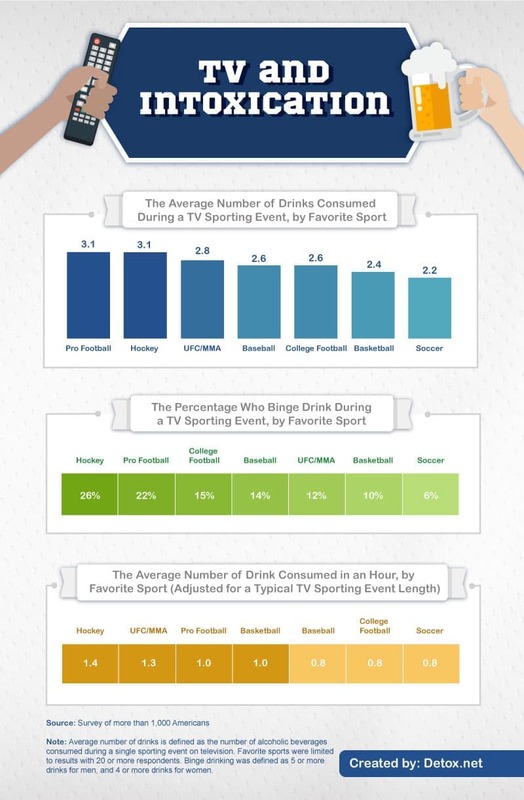 Our study found Americans typically consumed one drink each hour while watching football and more than one drink each hour while watching professional hockey or UFC/MMA events. Research has shown exactly what happens to your brain (and body) when watching sports – and it could be tied to how well your team is doing in the first place. Studies have found that when your favorite sports team is winning, the brain is more likely to release dopamine – the “feel good” chemical that leaves us feeling lighthearted and happy. In contrast, when our teams are losing, the brain releases cortisol (the “stress hormone”) instead, potentially leaving us anxious or depressed. How much a person drinks when watching sports could also be tied to how well their team is performing. Our survey found 1 in 4 professional football fans admitted to drinking more when their teams weren’t playing well, and nearly 1 in 5 college football fans said the same. In the same way that just watching football can change your mood, drinking too much (even in a single sitting) can also cause depression or agitation. Alcohol can even trigger or worsen anxiety – an emotion sports fans might already be feeling if their teams aren’t winning. For some Americans, winning was just as much cause to drink as losing was. Nearly 29 percent of sports fans said they drank more when seeing their soccer teams perform well, followed by more than 1 in 5 basketball and hockey fans. Despite the long-standing relationship between sports and alcohol, it turns out not all fans are willing to pay for their booze when they want to drink during a game. 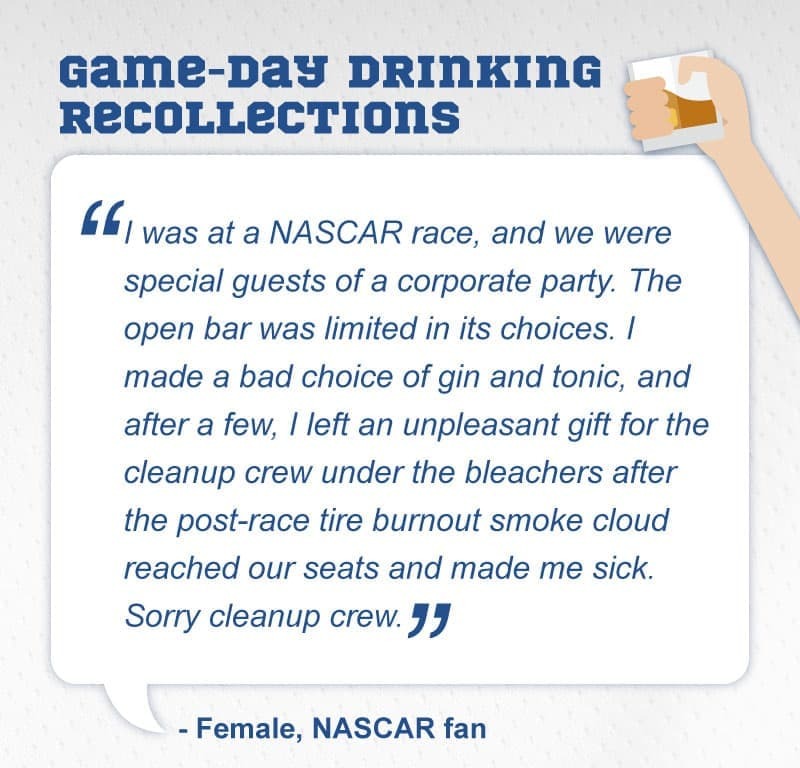 According to Americans polled, nearly 43 percent said they’d snuck alcohol into a sporting event, and almost 83 percent divulged it was beer. 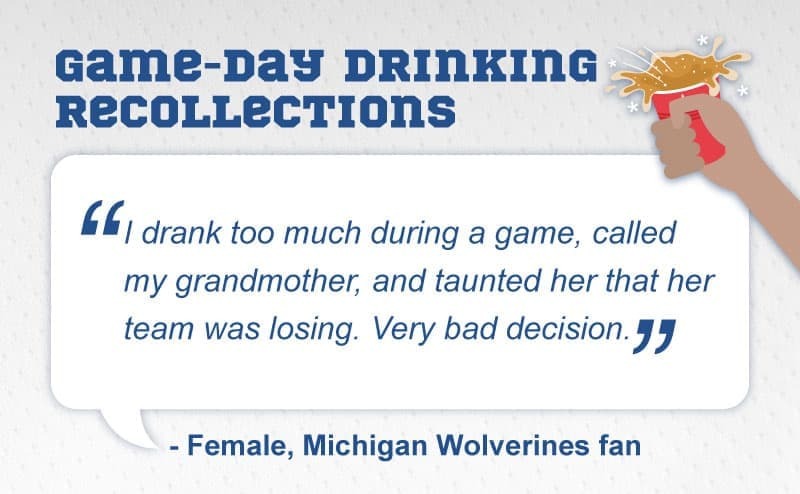 Most likely to occur among college football (56 percent) and professional football fans (45 percent), some sports fans simply opt out of paying for their drinks. When asked for their reasoning, the No. 1 response was that purchasing beer at the stadium was too expensive, though some indicated they brought their own alcohol because the stadium didn’t sell what they wanted or because they were too young to buy it. In fact, only a small percentage of college campuses currently sell beer in their stadiums, while an even smaller amount permit alcohol at off-campus football locations. College students are also typically more likely to drink (and drink heavily) than young adults the same age not attending school. 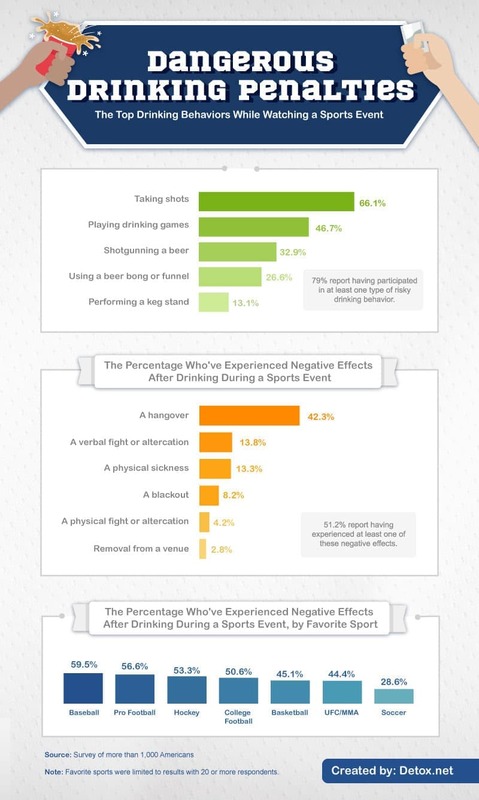 Considering the negative emotions that can sometimes be associated with sports, and the way alcohol consumption can act as a sedative or depressant, we looked at the negative experiences Americans had after drinking during a sports event. More than 2 in 5 Americans said they experienced a hangover after drinking during a sports match, while more than 13 percent said they got into a verbal altercation or became physically ill. Research has shown that the effects of drinking on the body (including hangovers) can feel more significant as we age. Even the short-term effects of alcohol on the brain can be damaging, and if a person drinks enough in a short period (say, the length of a football or basketball game), they could be more likely to experience symptoms like blackouts and memory lapses. While even just one serving of beer or wine can stay in your body for about two hours, two-thirds of Americans said they took shots of hard liquor while watching a sporting event. A single beer might have a 5 percent alcohol by volume concentration, but a single shot of distilled spirits can have up to 50 percent or higher. If you like to enjoy a beer while watching a sports game, you might want to make sure you aren’t unknowingly drinking too much. The average number of drinks Americans said they had while watching professional sports, like football or hockey, came dangerously close to exceeding the low-risk limits established by the NIAAA. Some even admitted to binge drinking – perhaps unknowingly – as they continued to drink while the game commenced. If you or someone you love has become dependent on alcohol – there is help. Because addiction can be a chronic disease, a person may continue to consume substances they know are hurting them without the ability to stop. Our goal is to help you find a treatment plan that meets your needs and guides you through detoxification and withdrawal. You are not alone. Visit us online at Detox.net to learn more now. 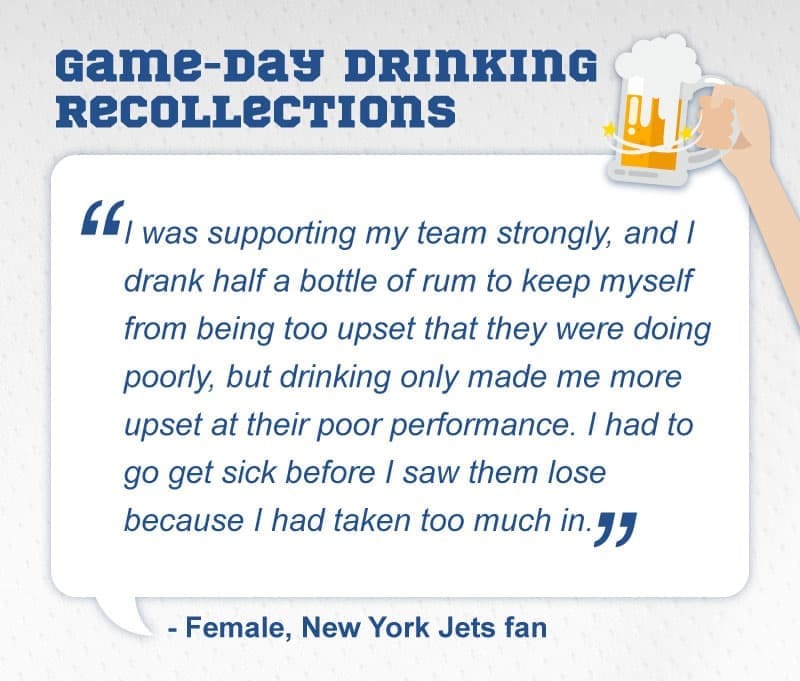 We surveyed more than 1,000 Americans about their drinking experiences when watching sports. Fifty-nine percent of respondents identified as men, 41% of respondents identified as women, and less than 1% identified as a gender not listed by our survey. 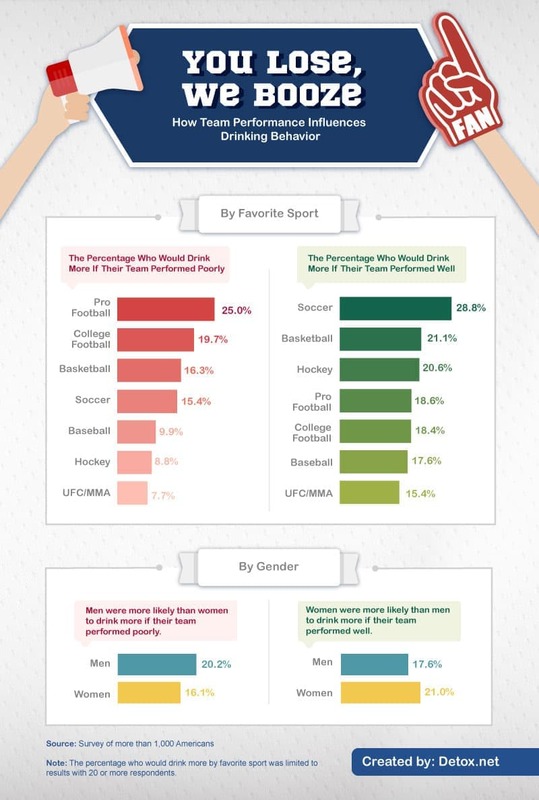 Results where we examined the number of drinks by favorite sport were limited to sports with 20 or more respondents. Binge drinking was defined as five or more drinks for men, and four or more drinks for women. 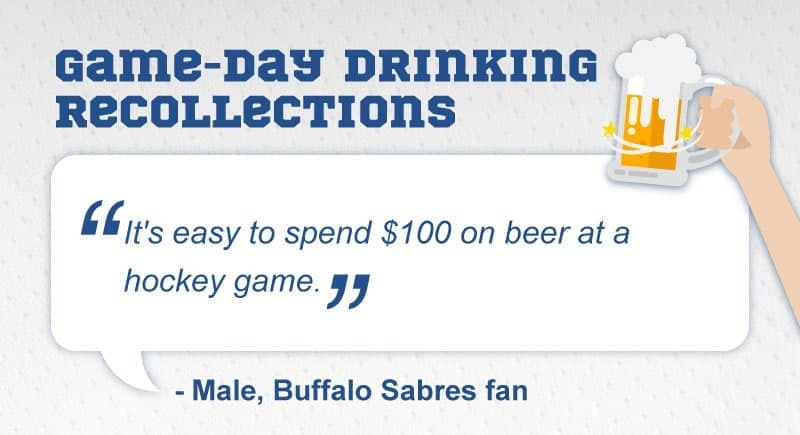 Second-guessing having that beer before the game now? We would love to see the results of our study shared on your website for any noncommerical use. We only ask that you ensure a link back to this page, so your readers can see the results of our study in their entirety.